Ryanair has struck a deal with Irish pilots, raising hopes that future pan-European industrial action can be averted. Talks between the low-cost carrier and pilot union Forsa started almost two weeks ago. An agreement was reached after a 22-hour negotiating session, which concluded in the early hours of Thursday. The deal, details of which were not revealed, will be put to the ballot with Forsa’s recommendation for acceptance. A spokesman for Ryanair said it will "take these proposals to its board in due course after the Irish-based pilots have voted on this signed agreement". Shares in Ryanair climbed sharply following the announcement, rising almost 7pc. 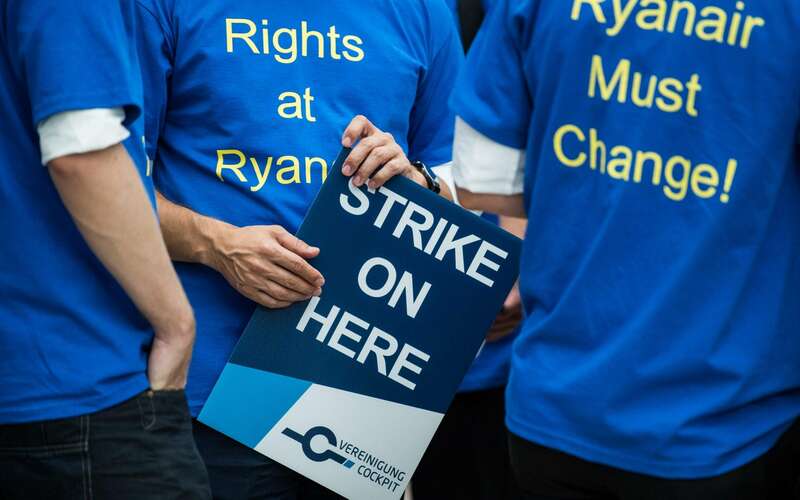 Earlier this month Ryanair was hit by its worst single day of strikes. One in six flights were grounded as pilots across five countries launched concerted action against the Irish airline. Ryanair, which is facing action from cabin crew, last month upped the ante in its public war of words with Irish pilots. It told more than 300 staff that their jobs were at risk, with plans to relocate a fifth of its Irish fleet to Poland. Boss Michael O’Leary later warned more aircraft could be moved amid “damaging” action by Irish staff. Ryanair stated potential staff cuts were reversible if strike action were to end. On the assumption that Irish pilots accept the agreed terms, hopes will be raised that a deadlock with their German counterparts in particular can be broken. Strikes by German pilots caused the largest level of disruption on August 3. Swedish, Belgian and Dutch pilots also walked out. Meanwhile, hundreds of flights were cancelled in July, when cabin crews from Belgium, Portugal and Spain went on strike for 48 hours. Neil Wilson, an analyst at Markets.com, said that “the agreement bodes well for management resolving the other labour disputes across Europe", in Belgium, Germany, the Netherlands and Sweden. "The likelihood is that remaining pilot union concerns will be resolved fairly quickly following this agreement. We also note that cabin crew disputes may not be as easily resolved, although the implication is that Ryanair is willing to engage with third-party mediators to square away these kind of disagreements," he said. He added that it "shows a new and not inconsiderable resolve by management to end the strikes, but it does not suggest the core thesis - that unionisation will result in higher labour costs and lower margins – is fundamentally wrong".